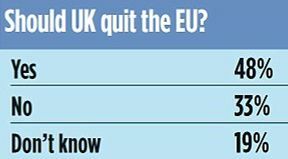 While the news that Germany is wanting to lead the EU in its own forceful manner to resolve the ongoing crisis, may Britons are of the opinion that it is time to quit EU. A recent survey concludes that most people believe the euro is doomed to fail and almost half think the EU will break up. They also fear the summit has given too much power to Germany. Read full report for more details.